“All workers within the right-of-way of a Federal-aid highway who are exposed either to traffic (vehicles using the highway for purposes of travel) or to construction equipment within the work area shall wear high-visibility safety apparel.” (Worker Visibility, 23 CFR Part 634). Additionally, flaggers and workers within range of vehicular traffic of any sort are required to wear safety apparel. There are a number of different classes of vests and apparel that adhere to the specifications at the job site, though state regulations should also be checked as additional requirements may exist. 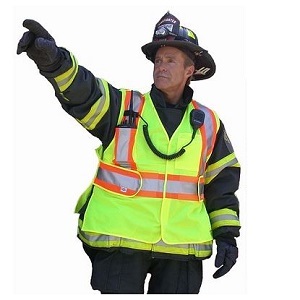 Class 1 safety vests and apparel are best for low speed situations that are not directly on or next to the road. They must have a minimum of 155 square inches of reflective tape around the middle of the body and over the shoulders. You may see workers in a residential area or in a parking lot with Class 1 vests. Class 2 safety vests and apparel have at least 201 square inches of reflective tape around the body and over the shoulders, as they are used in higher speed areas than Class 1. They are often worn by police officers, airport runway workers, during utility operations or by workers that have a physical barrier between them and the traffic. They are typically worn during daytime work, while Class 3 is more preferable for work done at night. Class 3 safety vests and apparel are used in high risk situations, where traffic is heavy and/or sight distance is low. If the speed limit exceeds 50 MPH, or workers are in bad weather, situations with low visibility, or high-crash locations, Class 3 vests are required. 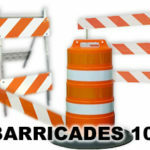 They are also used by ambulance responders, construction workers, flaggers, or anyone working directly on the roadway. The vests must have at least 310 square inches of reflective tape. Class E safety apparel does not refer to the upper body like Classes 1, 2 or 3, but rather the lower body in the form of waistband trousers or shorts. Class E bottoms worn with a Class 2 or 3 top is regarded as a Class 3 Ensemble. The regulated vests and apparel must be in either orange or yellow, allowing drivers to see them both at day and at night. Some include additional features like LEDs or a number of pockets. Unregulated vests and apparel, or Non-ANSI apparel, are available in other colors. Other safety apparel besides vests include a large variety of: high visibility shirts, sweatshirts, jackets and pants, safety coveralls, flame resistant clothing, safety rain gear and safety hats, backpacks and shoe coverings. High-visibility clothing labeled with their respective class do meet specifications, while clothing without a class label should not be assumed as fit for any particular roadside work.